Sunday next [8 April 2018] is the Second Sunday of Easter, often known as Low Sunday. The Readings in the Revised Common Lectionary are: Acts 4: 32-35 or Isaiah 26: 2-9, 19; Psalm 133; I John 1: 1 to 2: 2; John 20: 19-31. There is link to the readings HERE. The Second Sunday of Easter has a number of names that introduce us to important Christian values, ideas and concepts. In the Eastern Churches, the Sunday after Easter Day is known as Thomas Sunday because of the dramatic story about the Apostle Thomas in our Gospel reading this morning. In many places, this Sunday is known as Low Sunday. Some say it was called ‘Low Sunday’ because the day’s liturgy is something of an anti-climax after the solemn Easter liturgy and celebrations a week earlier. Some even joke that the day is known as Low Sunday because it is the Sunday choirs take off after their hard work during Holy Week and Easter. In some places this Sunday is also known as Quasimodo Sunday. This posting looks at the Gospel reading, and then offers an alternative reflection, built around the theme that next Sunday is also known as Quasimodo Sunday. 30 Now Jesus did many other signs in the presence of his disciples, which are not written in this book. 31 But these are written so that you may come to believe* that Jesus is the Messiah, the Son of God, and that through believing you may have life in his name. We find this phrase three times in the Gospel reading for next Sunday. It is a phrase spoken by the Risen Christ three times, with a Trinitarian resonance that reminds us of the three times God says to Moses, ‘I am …’, or the three visitors who receive hospitality from Abraham and who remind him of God’s commitment to fulfilling his plan for all creation. This phrase ‘peace be with you’ is a saying in the post-Easter story in Saint John’s Gospel that identifies the Risen Christ, now living in the Glory of the Trinity, in the same that the phrase ‘Be not afraid’ is phrase that identifies the Risen Christ in the post-Resurrection narrative in Saint Matthew's Gospel. In some churches, are we too glib about that phase, ‘Peace be with you,’ when it comes to exchanging the sign of peace? We can be a little glib, not just with our handshake, but with what we are actually wishing each other, in our hearts. The peace Christ is bringing to his disciples on this morning is not a cheap way of saying ‘Good morning.’ It is a peace that the Disciples sorely need. It is a peace that a deeply divided church needs. The Disciples have been sorely divided by the dramatic and traumatic events of the previous week or so. They know they are a deeply divided body of believers. One of them has betrayed Jesus, perhaps sold him for a pocket full of coins. Why, there are even rumours that he has now run off and killed himself, or that he is speculating in property with the money. Another, a most trusted disciple indeed, has denied Jesus, openly, not once, but three times, in public. He and another disciple went to the grave on Sunday morning, but weren't quite sure of the significance of the open, empty tomb. Indeed, it took a woman to wake them up to the reality of what was taking place. And yet another disciple is refusing to believe any of this at all. Was he calling us liars? Was he ever a true believer? Was he thinking of quitting? After all, he had not turned up for a few of the last meetings. It is to this deeply divided body of Disciples that Christ comes, breaking through all the barriers, physical barriers and barriers of faith, and says to them, not once but three times, ‘Peace be with you.’ It is not a mere greeting. It is a wish, a prayer and a blessing for those Disciples. And it is a wish, a prayer, a blessing that Christ still has for his Church today. We are still divided, separated from each other, in the same way as those early Disciples were separated and divided. These divisions are not necessarily along the old traditional fault-lines that once marked the separation between the different branches of the church: rather, they cross those barriers so that conservative Catholics and conservative Presbyterians find it easier to make common cause with each other than with other Catholics or other Presbyterians who hold more liberal views. We are like those Disciples: mutually suspicious, thinking others may not have realised the full significance of the message of the Risen Christ; finding it easier to know how others have denied Christ than to face up to our own denials; demanding of others a proof of faith that we would not demand of ourselves. Those divisions that were hurting and breaking the early Church could be compared, in many ways to the ways, to the divisions hurting and breaking the Anglican Communion. If we kept our eyes on the Risen Christ, rather than trying to make the worst of other’s intentions, then we might allow ourselves to see that the same Risen Christ breaks through all barriers, physical, geographical, spiritual, the barriers of time and space, and the barriers that separate liberals and conservatives, Protestant and Catholic, the radical and the Orthodox. The Risen Christ breaks through all those barriers and wants to gather us together into one, healed and whole body. In life, how often do we fail to make the vital connection between appearances and deceptions on the one hand, and, on the other hand, between seeing and believing? Quiet often, I think, this comes down to our different styles of learning and approaches to integrating information. How do you learn? Think of how you go about learning yourself. Can you remember the latest gadget you bought? When you get a new car, or a new computer, do you first open the manual and read through the instructions carefully? Once you have read the handbook thoroughly and understand how all it works, you then get to work on your own. Or perhaps you love buying flat-pack furniture, taking it home, and without ever looking at the instructions, figure out how to assemble it. Others, like me, get frustrated and end up with odd bits and pieces, but you see it as a challenge. Like a game of chess, you know that once all the pieces are placed correctly you are ready to move in and to win. The prize is that new coffee table or that new wardrobe. And then there are those who prefer to have someone sit down beside them, show them how to do things, from switching on the new computer, to setting up passwords, folders and email accounts. What sort of learners are Mary in the previous Sunday’s Resurrection story for Easter Day, Saint Thomas in this Gospel reading, and the other disciples in those readings? Two of them, John the Beloved and Simon Peter, had already seen the empty tomb, but they failed to make the vital connection between seeing and believing. When they heard Mary’s testimony, they still failed to believe fully. They only believe when they see the Risen Lord standing among them, when he greets them, ‘Peace be with you,’ and when he shows them his pierced hands and side. They had to see and to hear, they had to have the Master stand over them in their presence, before they could believe. But Thomas the Twin, or Thomas Didymus, is missing from the group on that occasion. He has not seen and so he refuses to believe. We can never be quite sure about Saint Thomas in this Gospel. After the death of Lazarus, he shows that he has no idea of the real meaning of death and resurrection when he suggests that the disciples should go to Bethany with Jesus: ‘Let us also go, that we may die with him’ (John 11: 16). And while Saint Thomas saw the raising of Lazarus, what did he believe in? 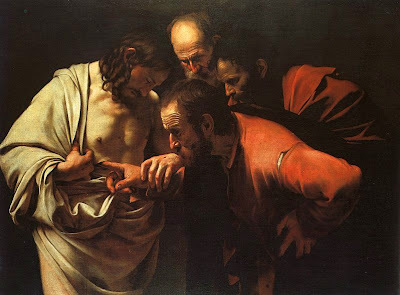 Could seeing ever be enough for a doubting Thomas to believe? At the Last Supper, despite assurances from Christ, Thomas protests that he does not know what is happening (John 14: 5). He has been with Christ for three years, and still he does not believe or understand. Seeing and explanations are not enough for him. On the first Easter Day, the Disciples locked themselves away out of fear. But where is Thomas? Is he fearless? Or is he foolish? For a full week, Thomas is absent and does not join in the Easter experience of the remaining disciples. When they tell him what has happened, Thomas refuses to accept their stories of the resurrection. For him hearing, even seeing, are not enough. Thomas wants to see, hear and touch. He wants to use all his learning faculties before he can believe this story. See, hear and touch – if they had manuals then as we now have, I’m sure Thomas would have demanded a manual on the resurrection too. His method of learning is to use all the different available approaches. He has heard, but he wants to see. When he sees, he wants to touch … he demands not only to touch the Risen Jesus, but to touch his wounds too before being convinced. Do you recall how Mary was asked in the garden on Easter morning not to cling on to Christ? So why then is Thomas invited to touch him in the most intimate way? He is told to place his finger in Christ’s wounded hands and his hand in Christ’s pierced side. In that moment, we hear the first expression of faith in the two natures of Christ, that he is both divine and human. For all his doubts, Thomas provides us with an exquisite summary of the apostolic faith. Too often, in this world, we are deceived easily by the words of others and deceived by what they want us to see. Seeing is not always believing today. Hearing does not always mean we have heard the truth, as we know in Irish life and politics today. It is easy to deceive and to be deceived by a good presentation and by clever words. Too often, we accept or judge people by their appearances, and we are easily deceived by the words of others because of their office or their privilege. But there are times when our faith, however simple or sophisticated, must lead us to ask appropriate questions, not to take everything for granted, and not to confuse what looks like being in our own interests with real beauty and truth. If we are Disciples of the Risen Lord, then we cannot stay locked away in the Upper Room waiting for God to put everything right at the end of days. We must take courage from the Risen Christ, we must have an Easter faith that allows us to take to heart that message ‘Be not afraid,’ and go out with the message, ‘Peace be with you,’ a message that must be made real in the lives of our own section of the Church, throughout the wider Church, and that must have the power to transform the world we live in today. In some places, including parts of France and Germany, the day is called ‘Quasimodo Sunday.’ The Latin introit for the day begins: ‘Quasi modo geniti infantes ...,’ ‘Like new-born infants ...,’ words from I Peter 2: 2 reminding newly-baptised Christians and all baptised members of the Church that we have been renewed, like new-born infants, in the waters of Baptism. Quasimodo, the sad hero in Victor Hugo’s novel, The Hunchback of Notre Dame (1831), was abandoned as a new-born baby in Notre Dame Cathedral in Paris on this Sunday, and so was given the name Quasimodo by Archdeacon Claude Frollo who found him. It is a story of how people are often judged, and judged wrongly, because of their looks, their clothes and their social status. Quasimodo is despised because of the large, ugly wart on his face and his disfigured body, and he is ridiculed for his inarticulate speech and for his deafness. And Esméralda fails to appreciate the true beauty and undying nature of the love Quasimodo offers her. Esméralda, for her part, despite her beauty, her compassion and her talents, is despised because of her ethnic background, her manners and her clothes: those who see her first see her as a gypsy, and so is side-lined and objectified. You might expect an anchorite to be a holy woman, but even Sister Gudele, figuratively representing the Church, curses the gypsy girl who is her true daughter, while Archdeacon Frollo’s all-consuming lust and desire for Esméralda run contrary to the ideals of his ministry and the mission of the Church. Yet, there is a hint at the Easter theme in this story: Phoebus is not dead, Esméralda is put on trial and sentenced to death unjustly, and is saved from death by Quasimodo. In the end, despite its sadness, it is love and not death that has the final triumph in The Hunchback of Notre Dame. 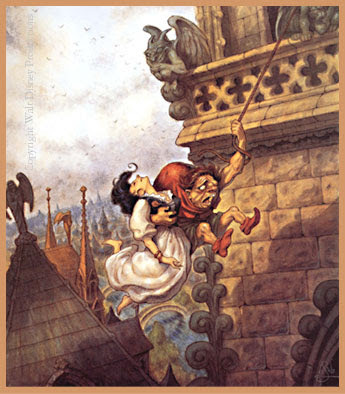 Victor Hugo may be a little old-fashioned today, but Quasimodo and Esméralda have important lessons and values for us today. Beauty is not merely in the eye of the beholder, and seeing is not always believing. Quasimodo may appear to be ugly, but his love is pure and has an eternal quality. Esméralda appears to be beautiful, but those who are stirred to passion on seeing her put little value on love, respect and inner integrity. In our society today, are we easily deceived by appearances? Do we confuse what pleases me with beauty and with truth? Do we allow those who have power to define the boundaries of trust and integrity merely to serve their own interests? Are we are happy to live in a society where a fiscal lack of accountability on the part of politicians, and where obvious obfuscation are accepted instead of honest explanation or confession, as long as my future continues to look prosperous and I continue to be guaranteed a slice of the economic cake? But appearances often deceive. Those who appear to be ugly are not so due to any fault or sinfulness, and they are often gentle and good-at-heart. Those who appear to be beautiful may threaten our personal confidence and security. And those who appear to guarantee economic, social or political stability may simply be serving their own needs and interests – as Esméralda finds out with Captain Phoebus and the jealous Archdeacon Frollo. As I asked in the reflection on the Gospel reading, how often in life do we fail to make the vital connection between appearances and deceptions on the one hand, and, on the other hand, between seeing and believing? and in baptism have made us one with him. 373, To God be the glory! Great things he has done! 255, Christ is risen, alleluia!